Very few upsets of ranked teams or any tough games at all, with the ease in which Kentucky beat Auburn, Duke ran all over Clmeson and North Carolina decimated Georgia Tech stood out like a sore thumb. We’ll actually begin with #15 North Carolina beating Georgia Tech 89-60, their first game following the overtime loss against Duke and also their first home game since the death of Dean Smith, the man who the arena in Chapel Hill is named after. 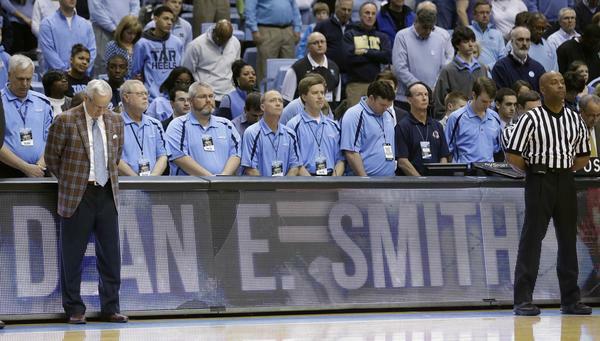 In honor of Smith, the Tar Heels opened the game with a four-corners play that actually ended in a layup, while Roy Williams let it rip on the home fans for being too quiet and that his players need more help and support from their fans. From the Tar Heels trying to make their way through the difficult ACC to the easy life Kentucky are having. A 110-75 win over Auburn including a 30-4 start won’t stop the critics from trying to find flaws in John Calipari’s team, but the Wildcats are 27-0 since the start of this season, 14-0 in the SEC and seem to be over the rougher patch of their schedule in which some felt there was a risk for the number one team in the nation to stumble. Six players scored in double figures, led by Karl-Anthony Towns with 19 points and Aaron Harrison scoring 18. Willie Cauley-Stein didn’t do too much, but once again let the world know just how good of dunk artist he is. Kentucky still have to play a ranked Arkansas team (at home) but the coast seems clear for them to win the conference title and head into the SEC tournament without too many worries or concerns. Duke carried the momentum of beating North Carolina in a classic encounter by destroying Clemson 78-56, as the number four team in the nation had no problem handling the Tigers despite the absence of Jahlil Okafor. Quinn Cook scored 27 points and Justise Winslow added 20 points, as the Blue Devils improved to 11-3 in the ACC, which still leaves them two losses behind Virginia and tied with Notre Dame for the number two spot. Not everyone had an easy time. Louisville barely scraped through against Boston College with a 55-53 victory; #14 Iowa State went through a tough game in Austin with a 85-77 win over the crumbling Texas. Oklahoma barely got by Texas Tech, and the same goes for Arkansas on the road against Mississippi State. Two ranked teams ended up losing this weekend: Butler, losing by 17 points on the road to Xavier while West Virginia, #23 in the nation, came away with a very impressive 73-63 win over Oklahoma State (#22) on the road.